The challenge was to rethink what a professional services website design might look like and rebuild the MinterEllisonRuddWatts corporate website. 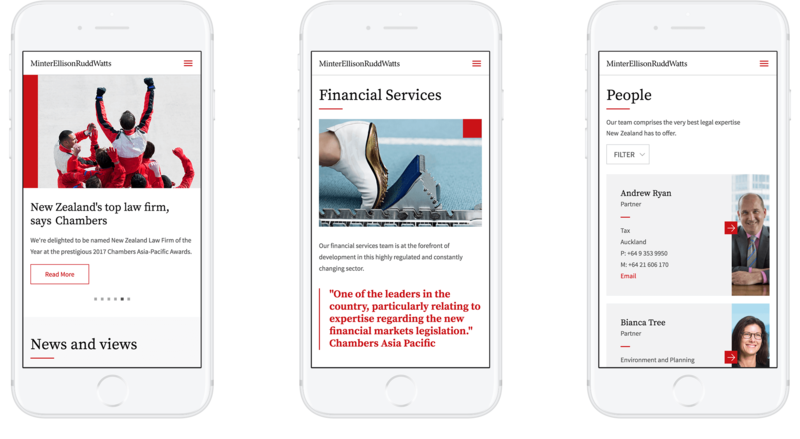 We transformed the MinterEllisonRuddWatts website to be more content-centric, to help them portray their credentials. To do this, we profiled and mapped people using the old site to gather information on how they used it. We then used this information to completely redesign their website, creating an elegant and easy-to-use IA/UX that fulfilled users needs, along with the addition of a helpful content hub. The previous website was not fulfilling the needs of MinterEllisonRuddWatts nor its visitors. It was time-consuming and expensive to change or update, the IA/UX was unintuitive and overly complex, and was not responsive, meaning it wouldn’t adapt to suit mobile and tablet users. To top it off, the site’s look and feel were simply not reflective of a top-tier NZ legal firm. We evolved the MinterEllisonRuddWatts corporate website from simply being a catalogue of articles into an experience-led destination that delivers information and inspiration. What’s more, it can now cater for many types of visitors, rather than just those from a specific legal background. The site is fully responsive, allowing people to access it easily using any device they prefer and the new Content Management System (CMS) we employed lets MinterEllisonRuddWatts update and change their own content quickly and cheaply. 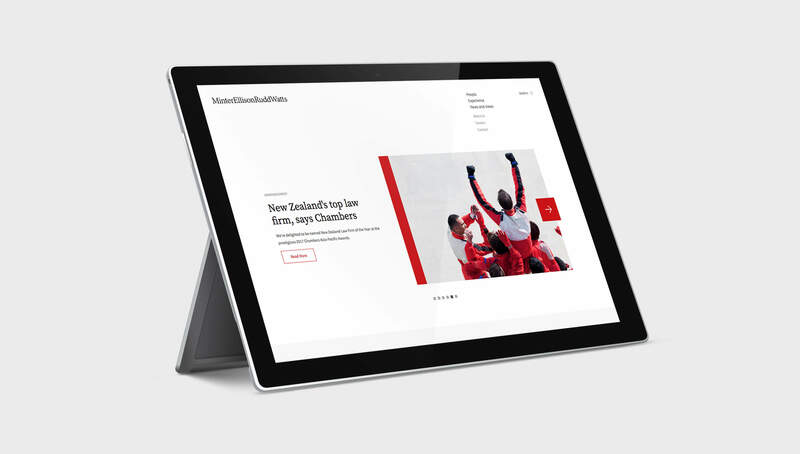 Lastly, the site’s visual redesign delivers an aesthetic experience you’d expect from one of New Zealand’s premier corporate organisations.